Formed in 1924 as the predecessor of the present Tokyo Art Dealers' Association and founded in 1949, the Tokyo Art Dealers' Association seeks to promote the highest standards of connoisseurship, scholarship and ethical practice within the profession. 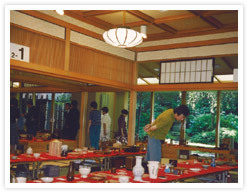 The Tokyo Art Dealers' Association is composed of the 500 nation's leading and renowned members who satisfied strict regulations, and gained credit for a reputation for honesty and integrity, have expert knowledge in a selected field of art and make a substantial contribution to the cultural life of the community, both within and outside of the nation. The members of the Tokyo Art Dealers' Association function as an important component of the Japanese art community, providing the means by which artists reach their public and collectors gain access to works of art. Currently, we organize dealers' auctions periodically. Except for that, the following events are open to the public and gain high reputations. 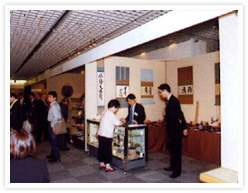 'Special Triennial Tobi Art Fair', 'Tobi Art Fair', 'The 21st Century Exhibition', 'Tobi Shofudakai' (Antique Bazaar), 'Seibi Tea Party' etc.